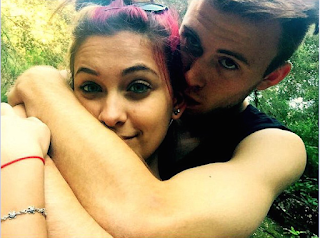 Michael Jackson's daughter Paris returns to social media flaunting her new boyfriend. Can you believe that's Michael Jackson's daughter? It's true. The young woman above is Paris Jackson, the second child and oldest daughter of the late King of Pop. She's posing with her boyfriend, Chester Callaw, in a photo posted to the couple's Instagram page (via the Daily Mail). The two are decked out in matching punk looks- and getting a little frisky, too. Callaw's sticking to his punk roots by flashing the sign of the horns as he gives Jackson a smooch on the cheek. Jackson, 17, and Callaw, 18, took their relationship public (the only way kids today know how- social media) back in April. She's had her share of troubles, having survived a suicide attempt last June. But she's better now - the photo above should be proof enough of that. Anybody who thinks Paris Jackson is black must be smoking crack!